Details on "Full Time MP"
John Hemming believes it is important that the people of Yardley are served by someone who concentrates on the job of being an MP. It is, of course, the decision, of the voters as to who they are happy to have as their MP and what other things they do. John Hemming, for example, plays the piano and also chairs the board of a company that he founded in 1983 which currently employs over 250 people (many in Birmingham). He has done this for 34 years. He is, however, a non-executive chairman and that responsibility takes under 4 hours a month. When he was first elected as MP for Birmingham, Yardley in 2005 he was councillor for South Yardley ward. He continued in that position until the election simply because representing the people of South Yardley can be done at the same time as representing the people of Yardley. South Yardley is in Yardley. The money from this went into a separate bank account used for services for the people of Yardley. These issues came up in 2015 during the general election on Twitter and the images below come from Twitter. That she would be a Full Time MP and not have another paid job. That she would resign her council seat in Longbridge. 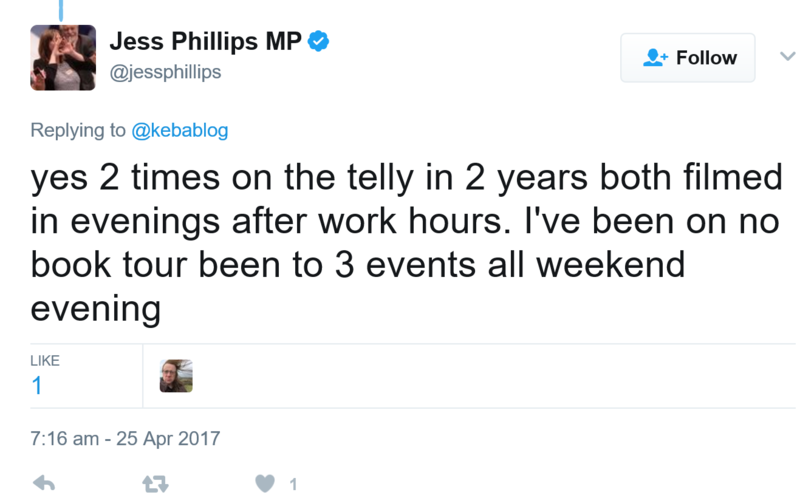 Jess Phillips was asked when she would be resigning her seat. She had decided to ignore her pledge and continue on. From this you can see that she said she worked 3 days a week for Longbridge in her first year in parliament and had a growing media and book writing career which paid her over £55,000. She has not declared the many hours she has spent promoting her book. Without those hours, which she really should declare, she has spent 1,274 hours on outside interests which works out at just under two days each week on average. This is why we believe her media career prevents her from representing the people of Yardley properly. She did "pledge" to not have any other job other than being a mother - see above (which we agree is a major commitment). How she squares her other activities with her pledge is not clear. The test for the voters, however, is whether she still does an acceptable job or not. John Hemming has been consistent in keeping his businesses going that have been running for decades. He is, after all, a major employer. However, the time commitment is an hour or two a week not two days. He concentrated on the people of Yardley. 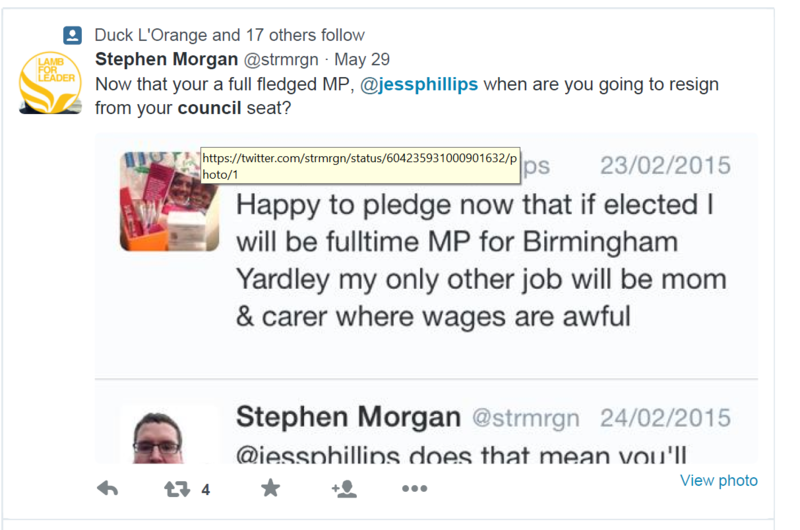 Does Jess Phillips with her developing media career have a sufficient commitment to the people of Yardley. We think not. That, however, is a decision for the voters to make. That the events are on Evenings and Weekends. This is a little misleading as it ignores the cancelled Bristol event planned for a Friday lunchtime here. This is a screen scrape in case the link gets deleted. This is, of course, significant. John Hemming used to meet people with the more complex types of casework on a Friday and visit places in the constituency. 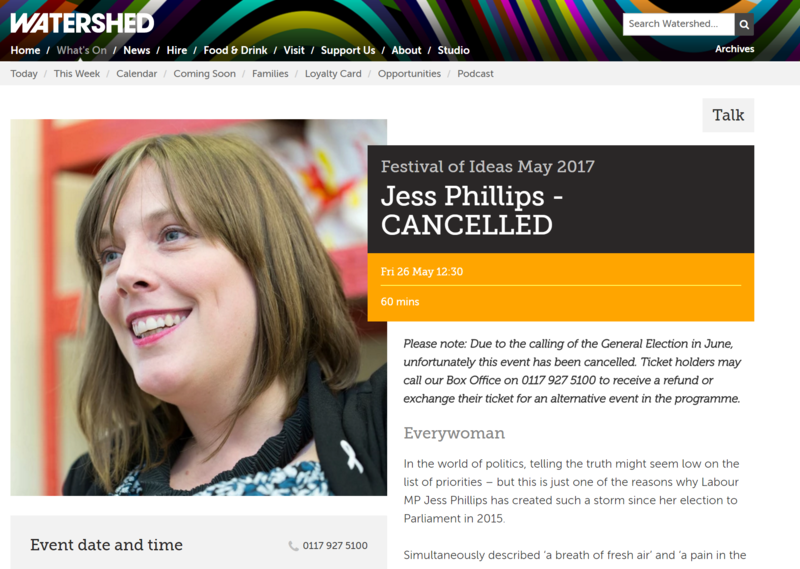 Jess Phillips was planning on driving to Bristol speaking at a paid ticket event to promote her book and then drive back to Birmingham. With a bit of luck, however, if the traffic was not bad she might just manage to get back in time to do her advice bureau at 5.30pm. However, the rest of the day is committed essentially to her second job that she promised not to have. Again it is a decision for the voters as to whether they want a full time MP that concentrates on the constituency or an MP that spends a lot of time on a paid media career and book promotion. At the time of writing she has still not give any details about her promotional activities other than the above.